Guitar amps that fit your life. Has your preferred guitar amp manufacturer been saving money on product design since 1957? There's nothing wrong with how vintage amps work, which is why we're starting out with hand wired, all tube guitar amplifiers based on classic schematics. But it's time to update that look a little. Especially these days, more of us are living in cities and our homes are getting smaller. We don't have a music room, and we don't have a lot of storage space. Chances are if you live in the city, you'll be in a condo, not a detached home. Your gear is going to be a part of your living space, and you shouldn't be embarrassed about the amp in your living room. It's a plastic wrapper for other amplifiers. Stop trying to convince yourself it looks good. Would you willingly cover anything else you own with this material? Treating your amplifier like it's Frankenstein's monster? Big screws and bolts certainly can hold everything in place. Alternatively, we could build a better cabinet. These amps aren't meant to be precious. They're meant to be played. Take it to a practice, to a gig. This amp is designed with the philosophy that objects look better when they wear. When the edges get rounded, worn and faded is when we think this amp will look it's best. Don't say musicians aren't interested in aesthetics. We'll hang the guitar on the wall, proudly. But as soon as the camera crew show up to shoot for Dwell magazine, the amps are out of sight. 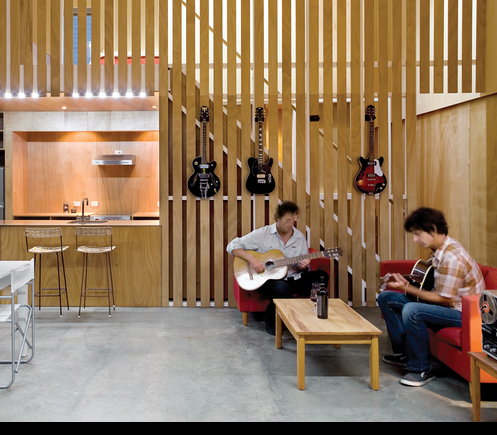 This is actually from Dwell Magazine.